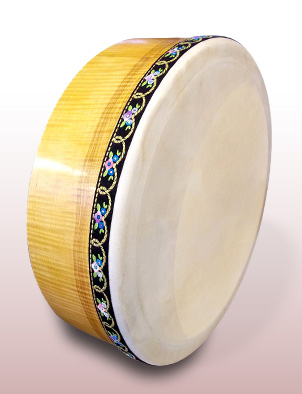 The traditional bodhrán changes constantly depending on ambient conditions. Sometimes too tight, sometimes too soft. To compensate for changes in temperature and humidity an adjustable tuning ring gives the ability to tighten or slacken the skin as required, ensuring the perfect note whatever the conditions. Our hand crafted, ‘Session Series’ and ‘Professional Series’ tunable bodhráns are available in two sizes, 14” (36 cm) and 16” (41 cm). Designed for the serious player who requires a quality drum to enhance their playing. Each bodhrán is hand crafted at our studio and finished to an exquisite shine using traditional techniques. Attention to detail is key! Using specially selected real wood veneers on both inside and outside of the drum, unique hand made wooden tuning heads and tuning mounts, and a specially chosen and prepared skin all combine to give the Professional Series that extra touch of quality.